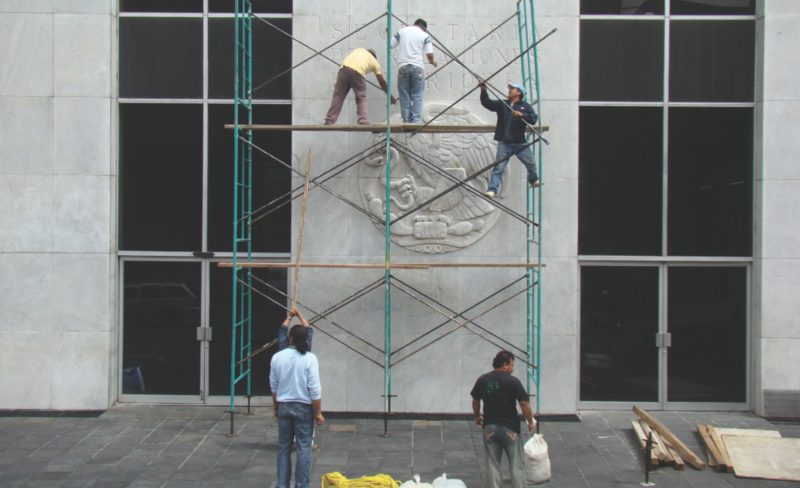 Dismantlement and Reinstallation of the National Coat of Arms, 2008. Intervention. Courtesy of the artists. This passage from a letter from one French philosopher to another somehow made its way to me, and now it has made its way to you. I would begin this missive of my own by supplementing Laporte’s glosses of the word brisure (themselves lifted from Robert’s French dictionary) with an additional sense culled from the Oxford English Dictionary: “brisure, n. 2. Fortification. A break in the general direction of a rampart or parapet; spec. of the parapet of the curtain adjacent to a bastion constructed with orillons.” To Laporte’s figure of the brisure as rupture and opening, then, I am adding the supplement of the brisure as fold, the effect of which being to multiply the length and surface area of a defensive barrier.2 This will be our point of entry/non-entry: a hinge, a joint, a threshold; or, alternatively, a fold there along the architectural border that would separate inside from out. “Baranda,” 2002. Courtesy of the artists. Other early pieces by the trio worked at the brisure from the other side of our composite definition. La BF15 + Pared (The BF15 [Gallery] + Wall, 1999) consisted of an addition to the exterior wall that separated the short-lived Galería BF15 in Monterrey from the adjoining lot. This wall was extended along an axis perpendicular to the façades of the two buildings, blocking the sidewalk and invading the street just enough to introduce a new spatial constraint into the curbside parking pattern in front of the gallery. The nuisance that this protrusion posed to pedestrians was only marginally more inconvenient than the uneven sidewalks that typically mark the passage from one private lot to the next in many Mexican cities. Both Trabas para puerta and La Bf15 + Pared might be regarded as repurposing the “breaching procedures” that sociologist Harold Garfinkel had developed in his ethnomethodological studies. “Since each of the expectancies that make up the attitude of daily life assigns an expected feature to the actor’s environment”—doors should open and close, sidewalks and streets should be unobstructed—”it should be possible to breach these expectancies by deliberately modifying scenic events so as to disappoint these attributions.”4 Garfinkel’s own procedures involved transgressing unspoken, preconscious social norms in order to phenomenalize them—that is, to make them apparent and thus to make their operation available to empirical observation. Despite their formal parsimoniousness, Tercerunquinto’s early, architecturally inflected breaches had a similar effect. The non-operational door in Trabas para puerta expressed and reiterated the jammed relations between apartment owner and lessee; the extended surface of La Bf15 + Pared phenomenalized the specific contours of an already disjunctive experience between private and public space in urban Mexico. Similar breaching procedures have informed Baranda (2002), Ampliación de un área verde (2004), and Camino trunco (2007). “Vecindad,” 2007. Intervention. Courtesy of the artists. Much of Tercerunquinto’s work around the turn of the millennium was characterized by a latent interrogation of the spatial relations of neighborliness. 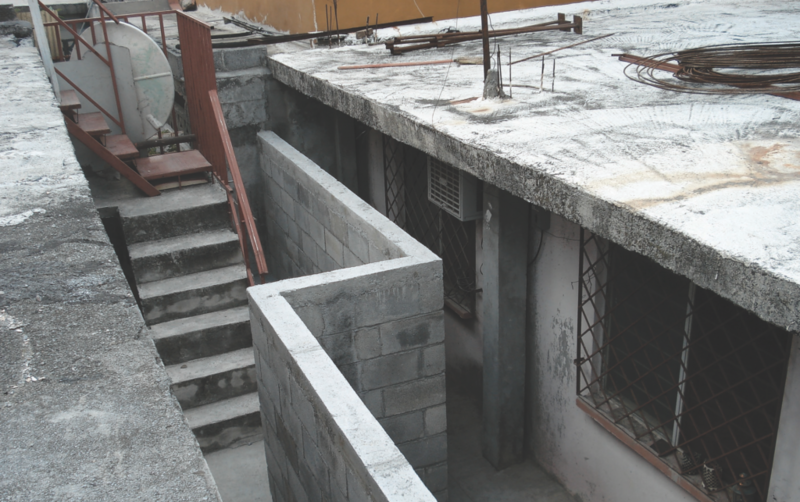 This interrogation was made particularly explicit in a project called Vecindad (2007), a word that can refer, on the one hand, to a specific kind of multi-family housing unit arranged around a central patio, prevalent in certain lower income neighborhoods in Mexico City; or, on the other, to more general notions of vicinity and neighborliness. For this project, the artists prompted negotiations between the owners of two adjacent prefabricated homes in order to reconfigure the wall separating their property, adding additional folds to its surface without altering the square footage of land occupied by either one. With an eye to the operation of the brisure in the collective’s work, it might be tempting to read the angular form of the reconstructed wall as a first architectural step on the evolutionary path toward a defensive parapet for each neighbor. The most salient aspect of Vecindad, on the contrary, is that Tercerunquinto assumed the position of a third party, initiating and mediating an exchange between two different actors. Here the artists’ architectural intervention was but a pretext for a social process, which ultimately became the core of the piece. By contrast to Trabas para puerta, which materialized the antagonistic relationship between a landlord and his tenants, Vecindad orchestrated an act of mutual accommodation, the practical territorial outcome of which being, quite deliberately, nil. “Project for Museo de Arte Álvar y Carmen T. de Carrillo Gil,” 2008. Courtesy of the artists. Vecindad was not the first time that Tercerunquinto had staged neighborly relations by spatializing them, putting them en scène. 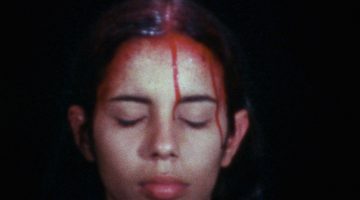 One of their more powerful actions, Proyecto para MUCA Roma (Project for MUCA Roma, 2004), had already used negotiations between neighboring sets of actors to reconfigure and re-phenomenalize the barrier between them, if only temporarily. 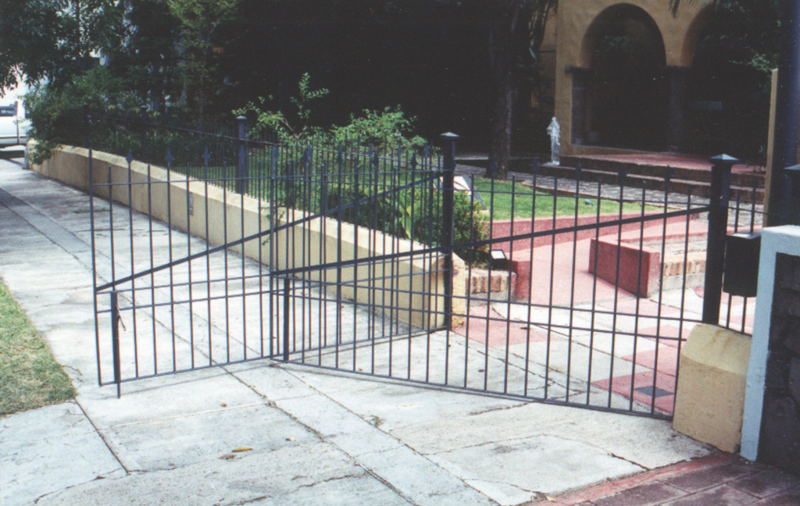 For this project, the artists sought to transform the space of the Museo Universitario de Ciencias y Arte in Colonia Roma, an outpost of Mexico City’s Universidad Nacional Autónoma de México, by converting it into storage space for a group of merchants who sold their wares at an informal weekend market on the median that bisects nearby Avenida Obregón. 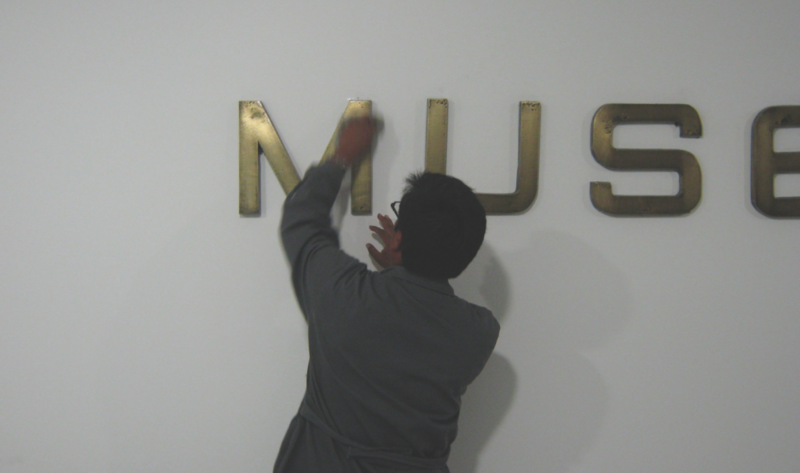 According to Mariana David, then curator of the MUCA Roma, the project involved negotiations with several actors, including the Legal Department of the Universidad Nacional Autónoma de México, “since temporarily lending its exhibition space to commercial use made it vulnerable to legal suits.”5 Individual vendors were eventually made to sign short-term contracts before they were assigned a padlocked storage space within the museum. The negotiations leading up to the exhibition lasted longer than the exhibition itself. The incorporation of participants in Mexico City’s bustling “informal economy” into the rarefied space of a university museum had the effect of putting the vendors—however briefly—vis-à-vis with university officials, museum staff, and the city’s art-going public.6 Similar processes of negotiation have been crucial elements of a number of Tercerunquinto’s recent works, notably Integración del Consulado General de México en Miami a la exposición Mexico: Sensitive Negotiations (2002, Instituto Cultural de México, Miami) and Acceso abierto (2005, The Power Plant, Toronto). 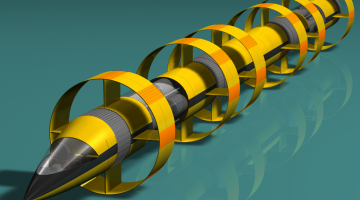 A set of spacing procedures constitutes a counterpart to the breaching procedures described above. 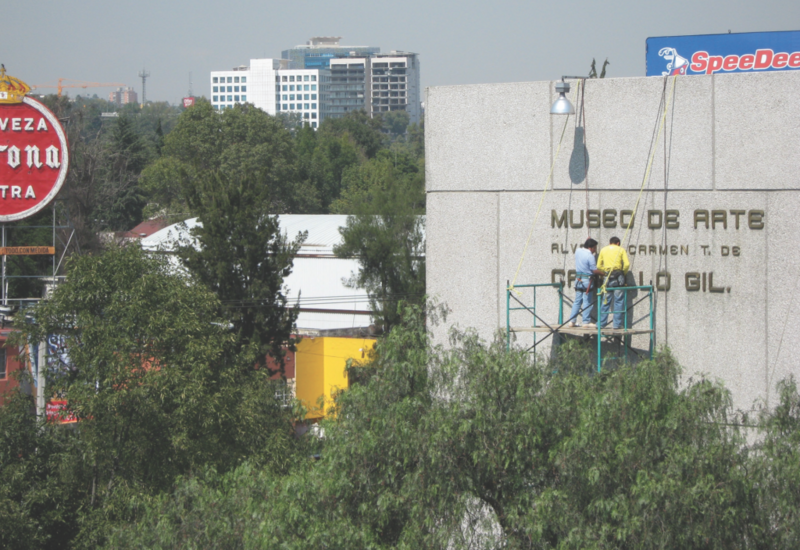 Perhaps the most potent example of these is Desmantelamiento y reinstalación del escudo nacional (Dismounting and Reinstallation of the National Crest, 2008), commissioned by the Centro Cultural Universitario Tlatelolco (CCUT) as part of a broader commemoration of the hundreds of protestors and bystanders who were murdered by federal troops at the Plaza de las Tres Culturas in Mexico City on October 2, 1968. 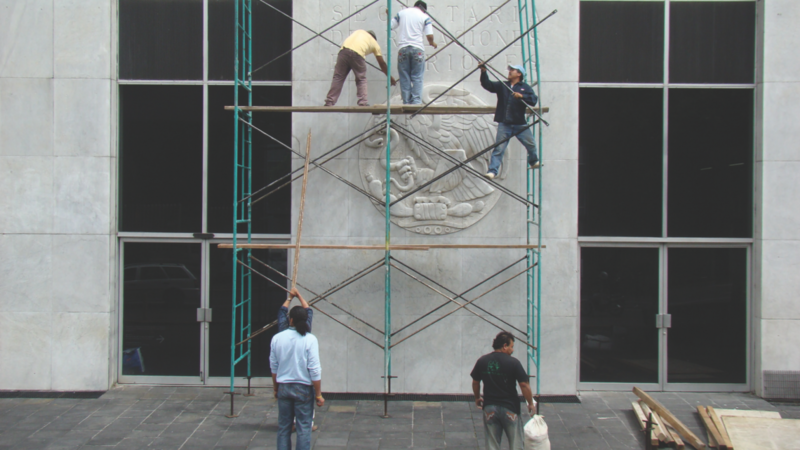 In the weeks leading up to the fortieth anniversary of the Tlatelolco massacre, Tercerunquinto removed five of the six marble panels that comprise the Mexican national crest on the façade of the CCUT. 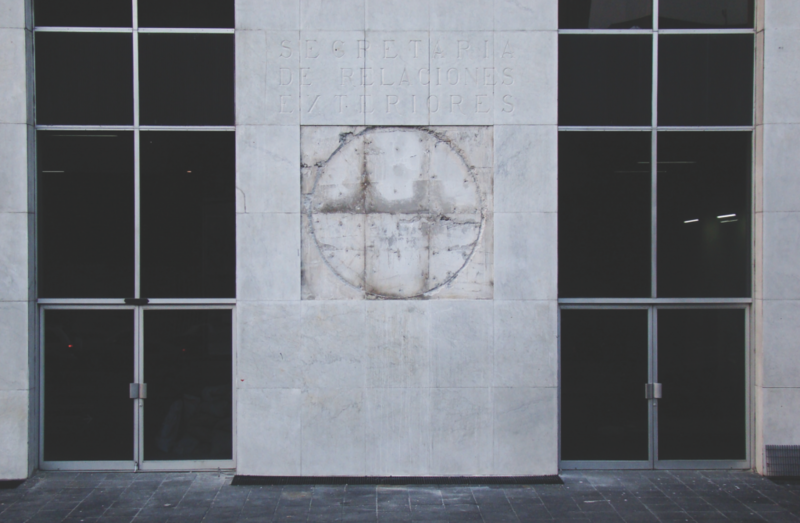 On October 2, 2008, the last of the six panels was dismounted, leaving in its place an empty space. This stood as a poignant index of the state of exception that had exempted the perpetrators of the massacre from the rule of law. 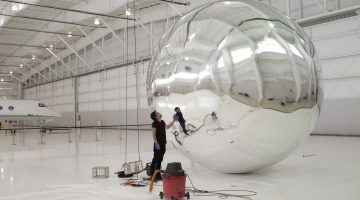 The following day, however, the artists re-installed the crest. In the interim it had been restored to its original brilliance, articulating two different moments in time with this installation of a novel brisure. 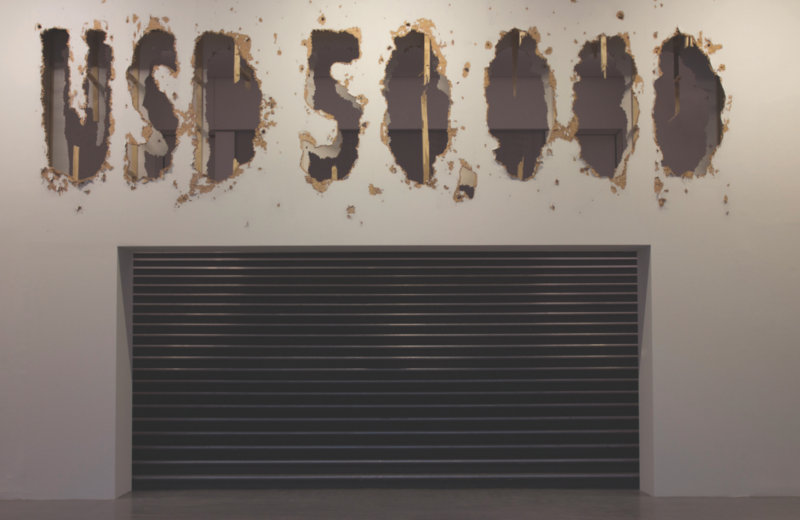 “No young artist can resist a $50,000 cannon blast,” 2012. 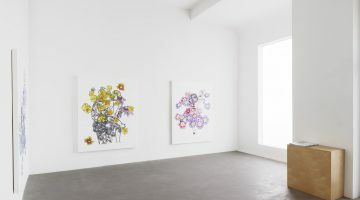 Installation view at Musée d’Art Moderne de la Ville de Paris, part of the group show Resisting the Present, Mexico 2000-2012. Courtesy of the artists. The spacing procedure that distinguishes these projects from the breaching procedures described above implies, again, a relation to phenomenality. Spacing—the blank interval that separates the words on this page, these very words, here—is precisely the non-phenomenal, that which does not appear, which does not disclose itself to sensory experience. 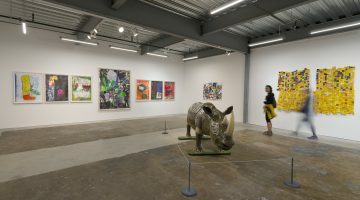 The impossibility of a brisure that would articulate these two different procedures has become evident only in some of the artists’ more recent projects. 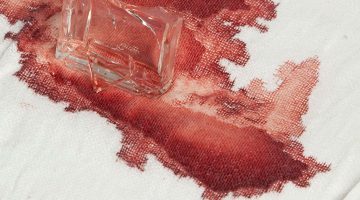 By contrast, Tercerunquinto’s most felicitous negotiation process to date has perhaps been New Langton Arts’ Archive for Sale: A Sacrificial Act (2007, 2013). 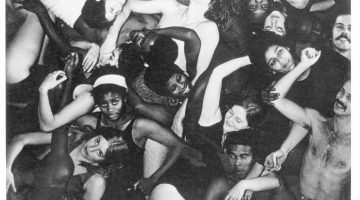 In 2007, during a residency at New Langton Arts in San Francisco, and after many consultations with figures at other institutions in the city, Tercerunquinto suggested that the non-profit arts organization sell off its most valuable asset: namely, its artistic and institutional archive, consisting of documentation for three decades’ worth of exhibitions, including photographs, slides, press releases, postcards, posters, and audiovisual recordings of events, as well as the organization’s financial records.12 These materials were collected in non-descript cardboard storage boxes and put on display in anticipation of a possible sale. 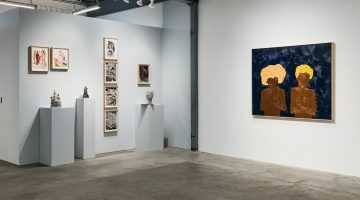 The proposal generated a series of impassioned discussions among the staff at New Langton Arts as well as in the San Francisco art community; some of these debates were in turn recorded as part of the documentation of the project itself. This circular distension of the structure of the project—here projecting the possibility of an interminable, almost Borgesian archive—bears more than a passing resemblance to the circle of infelicity that would condemn It Was Built To Fail to fail shortly thereafter. “A Sacrificial Act,” 2007. New Langton Arts, San Francisco. Courtesy of the artists. 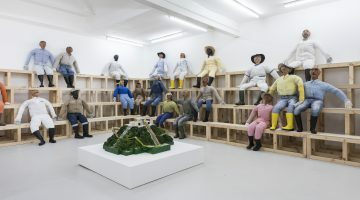 The artists have repeatedly underscored the importance of the subtitle to their conception of the piece for New Langton Arts: it was to be A Sacrificial Act. 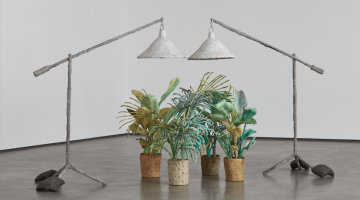 From an anthropological standpoint, the title of their project constitutes something of a category error, as sacrifice by definition entails an act of making (-ficus) sacred (sacer)—and is thus a form of communion with the divine—whereas a sale, mediated by the money form, would be difficult to regard as anything but the most profane of human acts. 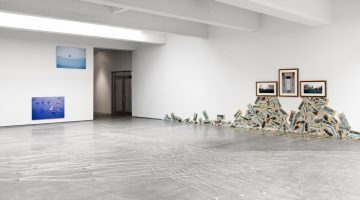 In effect, however, the artists were suggesting that the organization divest itself absolutely of both its institutional memory and its symbolic capital, thereby committing a kind of auto-decapitation. 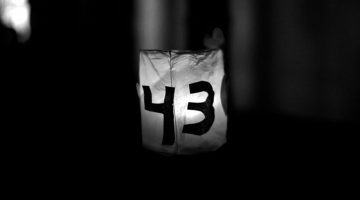 The money form of New Langton Arts’ payment would merely serve as the vehicle for the organization’s resurrection to come.13 With this sacrificial act, the collective’s negotiation process has assumed a decidedly messianic cast. This confrontation with death is the experience of the impossible par excellence. And here Tercerunquinto’s analysis has placed them before yet another threshold. They are poised to take their leave of the ontology that has grounded Western aesthetics since Aristotle framed the philosophical value of poiesis in terms of its relation to the realm of the probable.14 But to displace this ontology, to depart from the realm of the actual, the probable, the imminent, or the virtual, would be to step into death itself: “The impossible is the final death, the necessity of destruction for existence.”15 The impossible, as Derrida argued late in his own life, is a special kind of aporia or non-passage whose “elementary milieu does not allow for something that could be called passage, step, walk, gait, displacement, or replacement, a kinesis in general.”16 Through a protracted deconstruction of the problematics of the brisure, the members of Tercerunquinto—that partial and partible collective, that “something that is never complete”—have arrived at a breach into which they cannot step. 1) Letter to Jacques Derrida, quoted in Derrida, Of Grammatology, trans. Gayatri Chakravorty Spivak (Baltimore: Johns Hopkins University Press, 1976), p. 65. 2) The functional purpose of this fold was to provide a line of fire from the rampart to any would-be aggressors approaching the base of the wall. The Italian philosopher-architect Leon Battista Alberti was the first to conceive of polygonal walls as an effective architectural defense against heavy artillery, still a relatively new development in fifteenth-century Europe. See Geoffrey Parker, The Military Revolution: Military Innovation and the Rise of the West, 1500-1800 (Cambridge: Cambridge University Press, 1988), pp. 8-11. 3) For an explicit formulation of the brisure that articulates debt to guilt, see Nietzsche, On the Gene- alogy of Morality, trans. Carol Diethe (Cambridge: Cambridge University Press, 1994), pp. 39-40 and passim. 4) Harold Garfinkel, Studies in Ethnomethodology (Englewood Cliffs, NJ: Prentice Hall, 1967), p. 57. 6) One is tempted to read this piece, along with several others in the list that appears in the following sentence, in terms of Lévinas’s concepts of the autrui and the visage (too hastily translated as “the face”). See Emmanuel Lévinas, Totality and Infinity: An Essay on Exteriority, trans. Alphonso Lingis (Pittsburgh: Duquesne University Press, 1969). 8) For now I must leave aside the artists’ habit of signing their name “Colectivo 3er 1/5”. 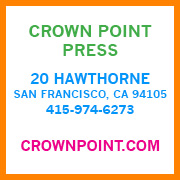 Suffice it to signal the translation between the graphic regime of the Roman alphabet and that of the Indo-Arabic numeral system, and to urge the reader to fill in the implied history. 9) See non-paginated insert included with the exhibition catalog. Taiyana Pimentel, ed., Investiduras institucionales (Mexico City: Museo de Arte Carrillo Gil, 2008). 10) Derrida, Of Grammatology, p. 89. 12) María del Carmen Carrión, “Apuntes alrededor de actos sacrificiales y males de archivo,” in Taiyana Pimentel, ed., Investiduras institucionales, proyecto #6 (Mexico City: Museo de Arte Carrillo Gil, 2008), p.1. 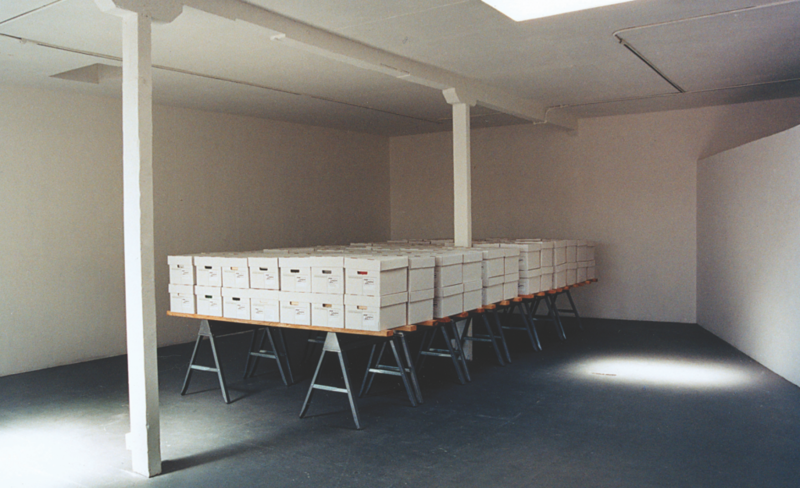 13) In 2013, Tercerunquinto re-staged New Langton Arts’ Archive for Sale: A Sacrificial Act at Galerie Peter Kilchmann in Zürich. 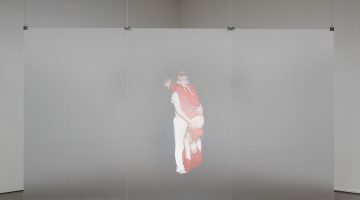 In its second iteration, the sacrificial act involved putting the artists’ own memory – in the form of their documentation of the piece – up for sale. 14) “It is not the poet’s function to relate actual events, but the kinds of things that might occur and are possible in terms of probability or necessity.” Aristotle, Poetics, trans. 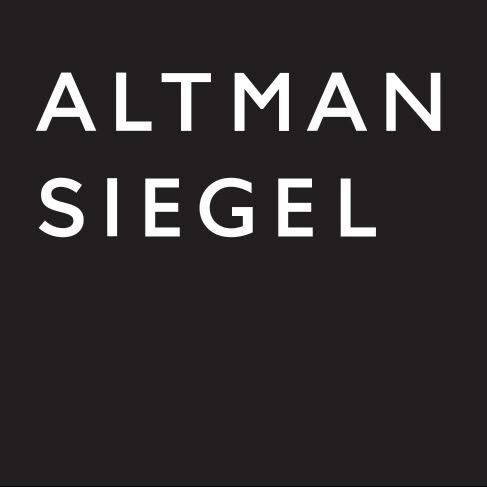 Stephen Halliwell (Cambridge, Mass. : Harvard University Press, 1995), p. 59 (§9, 1415a37-1451b26). 15) Georges Bataille, “Nietzsche’s Laughter,” in Stuart Kendall, ed., The Unfinished System of Nonknowledge, trans. Stuart Kendall (Minneapolis: University of Minnesota Press, 2001), pp. 18, 24. Bataille’s own explorations of the impossible, too, crystallized around the possibility of decapitation. See Denis Hollier, ed., The College of Sociology, 1937-1939, trans. Betsy Wing (Minneapolis: University of Minnesota Press, 1988). Christopher Michael Fraga is an anthropologist, translator, and writer. 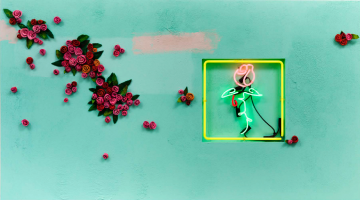 His current research examines the role of contemporary art and its proponents in mediating the economic and political changes that characterize Mexico’s recent history. He teaches in the Department of Sociology & Anthropology and the Latin American Studies Program at Swarthmore College.